Demonstrates how to measure a worn out chain using Sheldon Brown’s ruler technique. One of the most common problems I hear about is chain skip, which is when your pedal slips forward while pedaling under pressure. 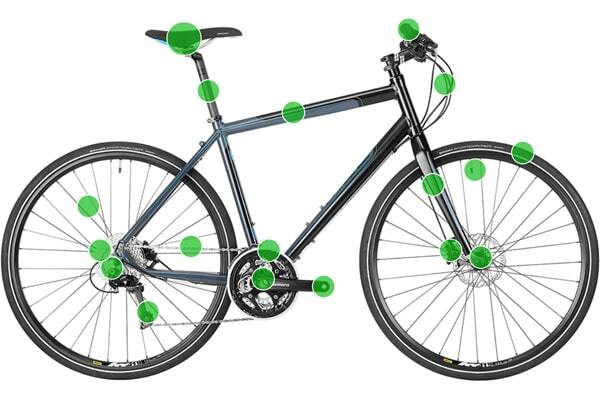 This is usually either caused by a stiff chain link, worn freehub body, or by a worn chain and freewheel. In this tutorial, we’ll learn how to diagnose a worn drivetrain. Watch the stiff link tutorial first to make sure that isn’t your problem. Once you’ve ruled out a stiff link it’s time to check if your chain is actually worn. Chains will ‘stretch’ over time, because the pins and bushings start to wear, which causes them to start skipping. There are many tools available that measure chain wear (listed to the right of the video), but the easiest and most accurate way to check is by simply using a ruler. With your chain still on the bike, place the ruler’s ‘0’ inch mark directly above the center of one of your chain pins. Now count 12 complete links. A complete link equals 1 inner and 1 outer. A rivet on a new chain should line up exactly with the 12 inch mark using this method. According to Sheldon Brown, if the rivet is less than 1/16″ past the mark, your chain is ok. If it’s between 1/16″ and 1/8″ past the mark you’ll likely need a new chain, but your sprockets should be ok. If it’s more than 1/8″ past the mark, you’ll have to replace both the chain and rear sprockets. The reason you’d have to replace the rear sprockets is because they generally wear with the chain. While the chain is ‘stretching’, the gap between the teeth on your sprockets also gets wider and wider. This causes the chain to ride up over the teeth and slip while pedaling under pressure. If you install a new chain on an old sprocket, you’ll probably be able to see gaps of light through the teeth as shown. Here’s how to replace a cassette or a freewheel. Your front chainrings generally won’t need replacing. Because of the larger diameter, the front chainrings usually take twice as long to wear. If worn they are very easy to spot, as they’ll start looking like shark teeth. Here’s how to replace your chainrings. Thanks to Sheldon Brown and Cambridge Cycling Campaign for the photos!